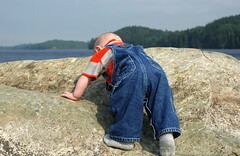 the eric update – day 358: odin’s crawling, climbing skills take him to new heights! while it’s not exactly cadillac mountain, odin looks quite impressive as he scales a rock near where the machias river empties into the bay. the harbor happens to be the spot where one of odin’s ancestors fought in the first naval battle of the american revolution. it’s astounding how quickly odin is developing his recently acquired crawling and climbing skills; at this rate, maybe next week we’ll practice doing dynos! Previous Postthe eric update – day 357: meeting more of the clan! an early ( and his first ) birthday present! and odin’s first piano lesson!Next Postthe eric update – day 359: tending to the bath with mamma like a big boy.